IDBI Bank Executive Recruitment 2018 - Check here complete details here : eligibility criteria, vacancies, how to apply, selection process, Pay scale etc. IDBI Bank Executive Recruitment 2018 -IDBI bank has Released Notification for the post of Executives on contract basis.Check here complete notification details, Important dates, Number of vacancies, etc. 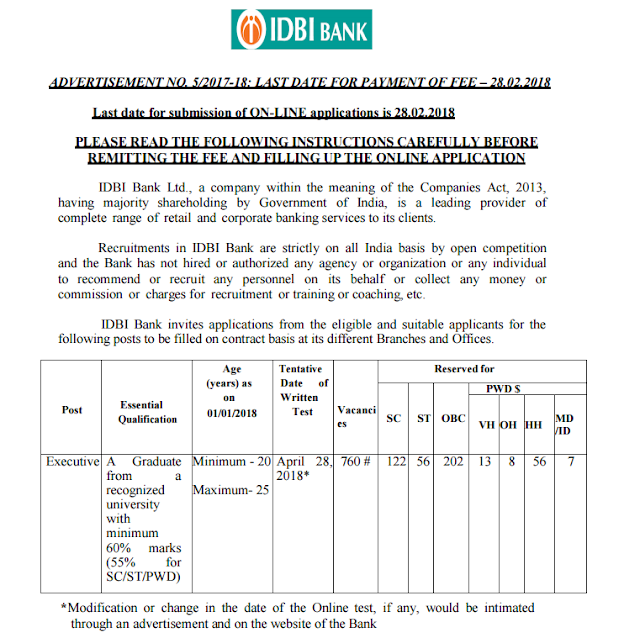 IDBI Bank Executive Recruitment process in Written exam followed by interview The selection process for the post of Executive will comprise of an Online Test. The above tests except the Tests of English Language will be available bilingually, i.e.